So meanwhile...did I tell you about...: Testing...testing...is this thing on? Well hello there and yes it has been quite some time since you've seen this little blog in action! 7 months and change, and it feels nice to be back on the blogging bus. But boy does my life look a bit different to what it did back in February! This is definitely the biggest and most obvious change to my life this year. And one I'm super excited about! Our little beebee is due 12/12/12 and yep, we're hoping its got a sense of occasion and comes out on that day - talk about a cracker birthdate!! It was a good few years in the making (we definitely didn't fall into the category of Nathan only having to look at me and I'd be up the duff!) but that's a-whole-nother story I'll get to in the coming weeks. Being pregnant has taught me plenty of things...but best of all, it's been a fabulous journey for me which I've absolutely loved, and I've felt fantastic the whole way along. 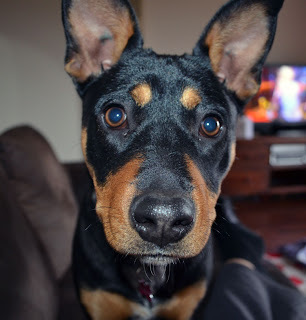 Not long after I wrote the last blog, we fell for a little Kelpie X with funny little ears at our local petshop...and decided to make Lola part of the McCliffy family. Well that definitely had its lowpoints at the start, but it rocks now and we love our little pupster! And how. Giving up full-time work and becoming my own boss was definitely one of the best decisions I've ever made in my life. I get to use my writing powers for good for a variety of people, do it when I want to and add to our bank account - noice! Ah, but I know what you're thinking...that's all great Jess, but what have you learnt this year? Plenty! This has been one of the key parts of my year this year - simplifying my life. As you know, I used to have lots of ideas and plans flying about, and liked to fill my time with a myriad of stuff. Well this year, I've been doing the opposite! Deciding to leave full-time work was the first part, and it was all about getting my life and health in better balance. And just quietly - once I became pregnant, I didn't have a great deal of choice but to do less! I found out that there would be days that I'd just need to lie on the couch for 3 or 4 hours because I was pooped...because you know, my body was doing an absolute world of stuff! That and my brain just didn't have the room. Getting my few bits of work done each week, looking after the pup, making time to rest and watching the changes to my body was well and truly enough. What I also found interesting, was that once I found out about becoming a mum, a lot of the other things I'd be rushing to do or cram into my life just kind of dropped away. I became really quite content knowing that this year was about our little family growing and that the other things that I'd like to do (be it study, travel, start new enterprises) - well they'll all happen at some point, but I don't need to think about it for now. Jess, growing a baby is enough for this year!!! But I think this has now given me a reference point...knowing our little one comes into the world late this year then sort of plots out the timing for a few other things. And it'll all unfold when its supposed to. Boy oh boy, was this one that got tested the past few years. Exhibit a) was wondering when on earth it was finally going to be the right time for us to become parents! This year, I've become a lot more relaxed about timing in general, holding onto my belief that everything happens exactly when its supposed to, and that the Universe always, always brings us what's best for us. It's affected the little things, eg not stressing if I'm going to be a little late for an appointment - I'll get there at the perfect time. And who knows why I need to be there then?! Also knowing that we'll keep getting the clues we need to move forward with what we're doing. Oh and another big thing was trusting I'd made the right decision to leave work...and then, that work will keep flowing in. And it was, and it has! The other big part of trust this year has been trusting myself and my intuition. Bodywise, this has meant going with what I feel like eating and doing, knowing that body and beebee know what they need. Took some getting used to, but hey - why fight it if you want to eat chocolate!!!! Also I've become soooo much better at trusting the little intuitive nudges and ideas I get - and I've been doing pretty well to act on them, even if I don't know where it's all leading to! This is definitely the best thing that Lola has taught me this year - yep I've now got a pup as a teacher too! Anyone with a dog (or any animal really) will know that they only live in the now, they don't know any other way. So Lola coming onto the scene was perfect for me, because she reminded me so many times to just focus on whats happening in this instant. That and we've had lots of fun this year, playing in the now!! Again, the whole reason I made the decision to leave my job last year was to find more balance in my life and as it turns out, I've managed to achieve that! I went to an Ayurveda appointment a month or so ago to check in and find out about the Ayurvedic approach to being pregos is...and the dude was most impressed that my doshas were all so in balance. Look at me go! It's definitely what I credit for my current situation...for me, I think being able to bring my body and mind into a pretty good state before I became pregnant has lead to having an awesome time of it. No morning sickness (which has made many friends want to kick me!) and none of the other side effects a lot of other people get...just feeling balanced and if anyone asks me how I'm feeling/going, I can honestly say 'I'm excellent'!!. So getting back to balance, I'm doing pretty well with the work part and rest...although as I've found this last month, I do need to remember that while I'm in the glory stage of being preggas (aka 2nd trimester and start of 3rd) where you have the most energy - there's still a lot going on inside and I do need to make time to rest each day! My focus at the moment is just weaving a bit more play back in, which I include as doing things that make me smile and light me up inside. So yes, you will be seeing more of me on here which I'm quite excited about. I really haven't done much writing at all this year for myself personally - it's turned out to be a year of dealing with things as they occur by thinking or speaking about them. But I still heart words in a big way, so I'm back baby!!! PS I love this pic of Lola - I was playing around with my new fandangled Digital SLR and she walked right up to the lens...huh, what's all this about?! Dang, just looked at the time...I could have waited just one more minute and it would have been posted at the magical 11:11! !